Dr. Michael J. Reed has a passion for athletics. He was born and raised locally in Waukegan. In his teen years he wrestled and played both football and baseball for Waukegan High School. 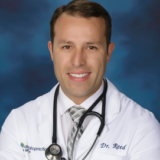 Dr. Reed was always interested in health and wellness, he completed his Bachelors Degree in Biology from Western Illinois University. He then went on to earn his Doctorate in Chiropractic Medicine, and a Masters Degree in Sports Medicine and Rehabilitation. Dr. Reed is also a certified Emergency Medical Technician. Dr. Reed currently works with several sports teams including Trinity International University, Waukegan Youth Wrestling Team and Waukegan High School. Dr. Reed serves on the Waukegan Chamber of Commerce.